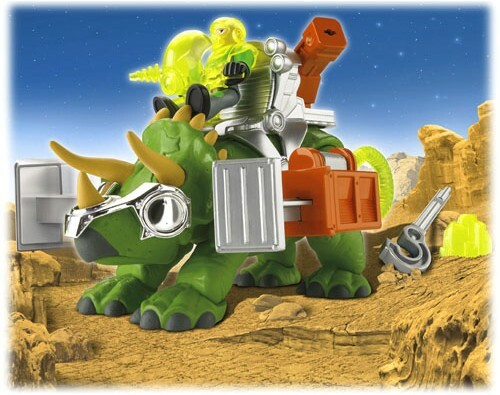 The Imaginext Mega T Rex from Fisher-Price is out for 2011. If you have been waiting for new T Rex toys to come out in time for the Holidays you wont be disappointed. The Imaginext T Rex is actually two toys in one. By day he is a roaring, head turning dinosaur. But Mega T Rex also likes to go high-tech and don his battle gear with long robotic arms. One minute this T Rex toy may be ruling his prehistoric forest but in a twinkling Mega can transform himself from his Jurassic Park to a futuristic battle droid from Star Wars. Now he’s battling on an alien planet in space complete with a battle helmet, battle pod and missile launchers, all of which opens up wide possibilities for creative and imaginative play. 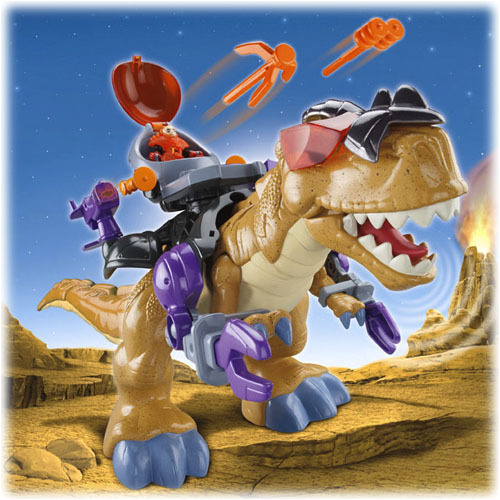 The Imaginext T Rex has great details and motorized action makes for loads of fun. Dressing this T Rex toy in his armor adds a whole new dimension to dinosaur play. His arms and neck move and his jaw opens—all with the push of a button and he can even launch missile from his pod. 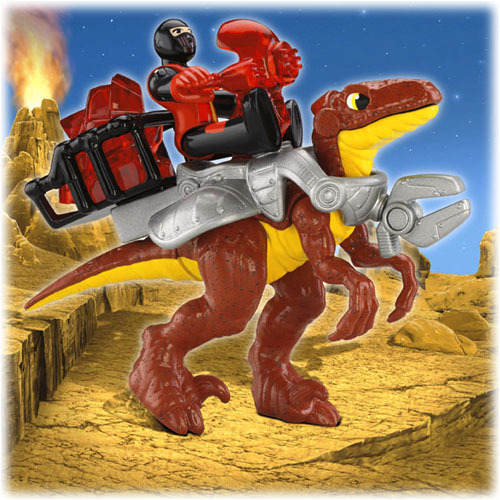 Kids from 3 -7 years will love the Imaginext Mega T Rex action toy that combines dinosaurs with futuristic fantasy adventures. These T Rex toys are very popular on Amazon. 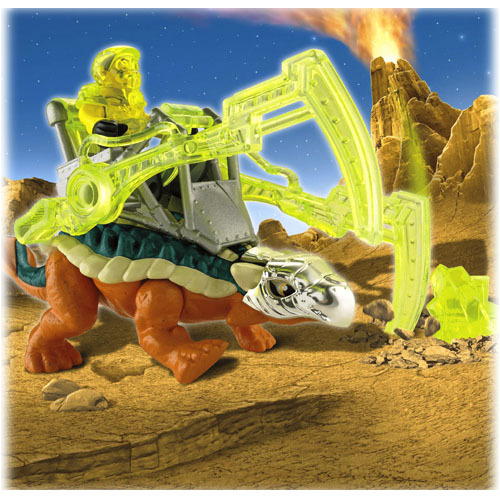 Probably this is the most popular in this whole Imaginext dinosaur series. There are almost 300 reviews for this dinosaur toy. It has earned a 4.3 out of 5 stars rating and most reviews are very favorable with parents liking the price and kids loving the toy. As a mom of four boys, we have found Imaginext toys to be not only some of the best toys on the market, but some of the most enjoyable to play with. We have bins and bins of them, starting with the old school construction sets. We also own all the dinosaurs that came out a few years back. They are similar to these dinosaurs, but they did not come with all this FUN battle gear. 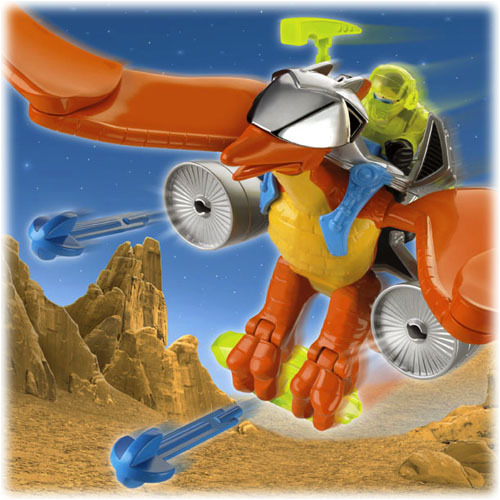 A dinosaur with removable armor and mechanical claws that roars and can launch missiles?!? My children couldn’t get this out of the box fast enough. They have had it for a few weeks now, and while it doesn’t enjoy the hours of play it received the first day, the T Rex is still used at least once a day. Pros: It’s a great, large dinosaur! Easy to hold and maneuver, and lots of fun with the accessories. My kids have used it fully geared-up, and without all of the armor as your typical T Rex. They love to stomp around the house with it and make it roar. It’s also pretty durable, as I’ve come to expect from Imaginext. My children are 3 and 5, and this T Rex has seen a good thrashing. It still has all of its pieces and nothing has cracked or fallen apart. It does require batteries, but battery life seems reasonable. Cons: It is a little unstable due to the large head. It does topple over when standing if you don’t position it exactly right. Still, it’s pretty fun! And no, it does not walk on its own, but my kids seem to have more fun stomping through the house and making their own noises and movements than using a remote control.